How can a train passenger in oatmeal tweeds just disappear? 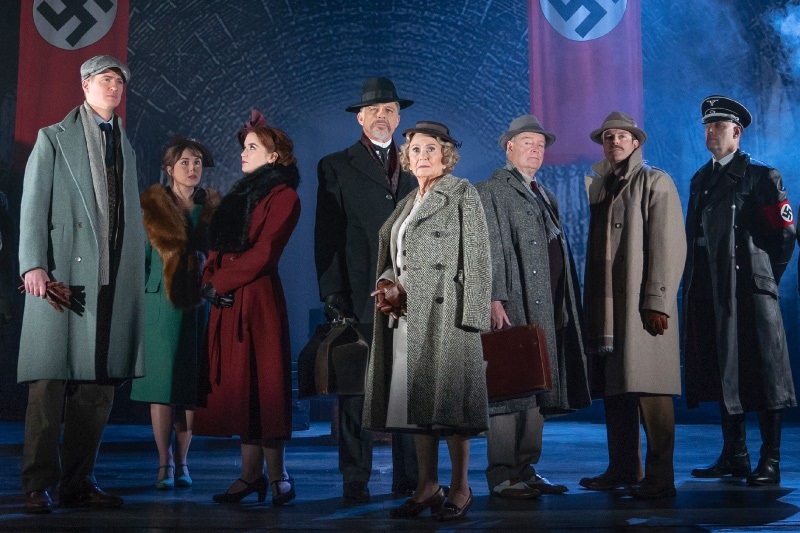 Well it’s a chance to unravel this Hitchcockian mystery at Malvern Theatres this week in a stage adaptation starring husband and wife Juliet Mills and Maxwell Caulfield. All passengers are delayed waiting for the next train to Zurich trying to find rooms in the nearest hotel to no avail and a young Iris, Lorna Fitzgerald, first encounters Maximillion, Matt Barber. Max proves to be about as popular as a dose of strychnine. Some clear references to the film and jokes included about sharing the maid’s room ensue. After the avalanche is cleared there are 10 minutes to get on to the train and everyone panics and rushes about causing Iris to suffer a blow to the head by a pair of skis. Miss Froy, Juliet Mills, comes to her aid and helps her onto the train to calm her concussion with a nice cup of Harriman’s Herbal tea, so good that “a million Mexicans drink it”. After a good sleep Iris awakes to find Miss Froy has completely vanished and her compartment companions are all in cahoots that she was never there in the first place. Signor Doppo an Italian Magician, Mark Carlisle, feigns a lack of understanding and Dr Hartz, Maxwell Caulfeld, blames hallucinations after the concussion, he is a neurologist after all. The unlikely comrade in the form of Max becomes embroiled in solving the mystery with Iris as other passengers do their best to avoid hysteria or get involved with any drama. The first Act ends abruptly after a sword fight and another disappearing act. The second act has more drunken cricket talk by travelling companions Charters, Robert Duncan and Caldicott, Ben Nealon, who are far more interested in batting their worries away and lawyer Eric, Philip Lowrie, with his mistress Margaret, Elizabeth Payne, trying to keep a low profile. This vivid thriller journeys from light comedy to high tension and back again with gun fight, spies and Churchill thrown into the mix and a happy ending to boot. The set designed by Morgan Large includes a grand terminus and stunning train compartments with sliding doors and directed by Roy Marsden all the actors moved and swayed to really give the genuine feeling and movement of being in a train carriage. Who was the nun in high heels? Did Miss Froy really know her Schubert? Whatever happened to Iris marrying her English Lord?